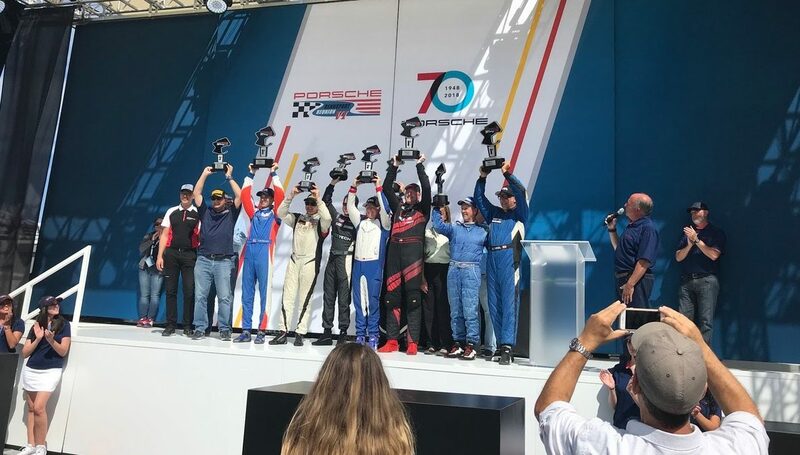 Following an awe inspiring four-day celebration of 70 years of Porsche Racing History, the “Marque of Champions” was the culminating event for attendees and drivers alike with over 300 cars, competing in 7 groups and special exhibitions, on the 11-turn, 2.238-mile road course at the Historic Laguna Seca Raceway. We were honored to be able to participate so fully throughout the weekend with our Founder and CEO, Kevin Buckler, selected as one of the 50 “Legends” of Porsche Racing, our Porsche 66 car from his Epic overall win at the 2003 Rolex 24 Hours of Daytona featured in the Chopard Heritage Display and to have our driver, Chris Bellomo, Coach, Robert Orcutt, and the entire TRG team represent us at the highest level for the PCA National Club Race in the GTD class. “I really have to thank my family at this point…when I started this racing adventure over a year ago I had no idea where it would take me, or how much time I would need to invest. I do know that my progression on the track would not have been possible without the support of my family….my wife Michelle, and two daughters Riley and Mackenzie. They have encouraged my new passion wholeheartedly and have been patient through my many days away from home. Their trackside presence has been a great motivator at my local races. I couldn’t be more thankful for their love and unconditional support. 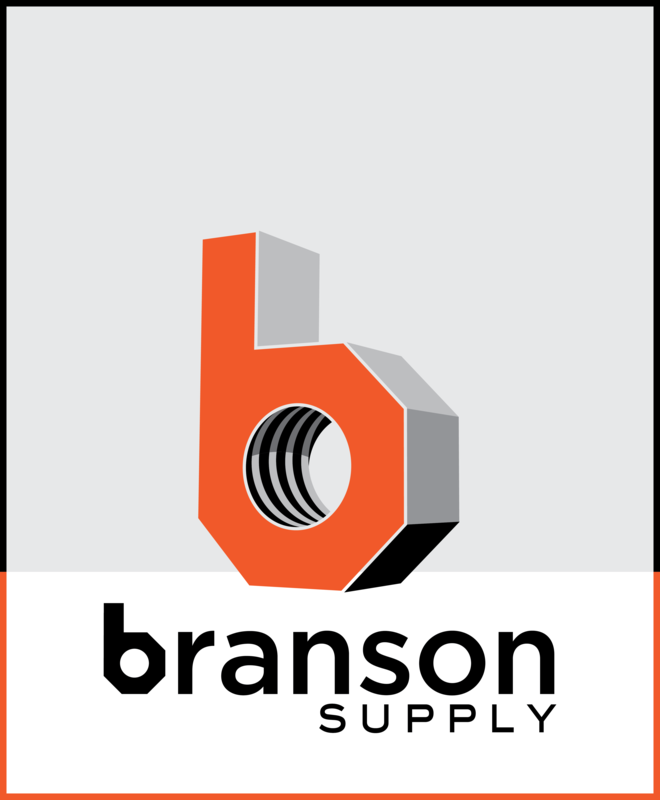 The success I have had as a driver can be directly attributed to how Robert (my coach) has prepared me for each time I am in the driver’s seat. His knowledge, attention to detail, patience, time, and friendship have inspired and motivated me from race to race. At the beginning of 2018, we circled the California 8 Hour on the calendar as a goal. Robert put a driving plan in place that has included many test days in my car and different cars, karting days, and hours of data and video review. And as the year progressed the 8 Hour goal started to become more and more attainable. After wrapping up the championship of the Pirelli Porsche Trophy Series with a win at WeatherTech last month and the class win at Rennsport just a few days ago, we made the decision to run with PWC. I am very fortunate to be co-driving with Robert and Tom Dyer and can’t wait to learn from them and test myself against the other drivers in the 8 Hour field. About The Racers Group, Kevin and Debra have put together a fantastic team around me. Week after week my racecar has been well prepared even when we have had very short turn around times between races. The schedule has occasionally been daunting. But TRG has proven themselves over and over and that has led us to 2019. We have an ambitious plan for 2019 too and I couldn’t think of a better group of people to continue to work with to prepare me and my car for next season. Thank you TRG! “Quite the weekend! Maybe the pinnacle of the year? 2 track records and the win for Chris. All the hard work by the crew, and all of the seat time for Chris, has really been paying off. Wow! And to do it at Rennsport? At WeatherTech Raceway Laguna Seca. Just Wow! Of course, these successes don’t just happen, it takes a lot of planning and teamwork by a lot of people. The whole TRG team gets the credit for these milestones. Where to from here for Chris and TRG? 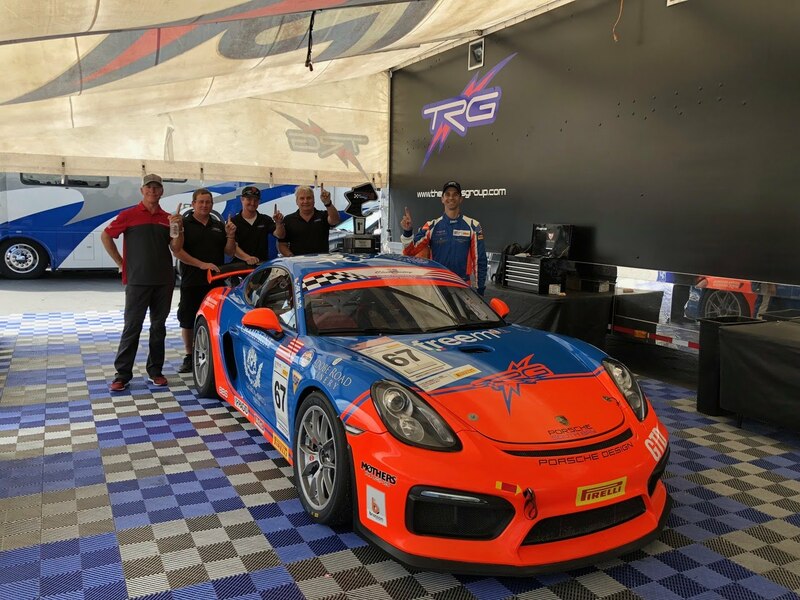 Well, Chris and our team have wrapped up the 2018 Pirelli Porsche Trophy GT4 Championship, we won Rennsport, we garnered a few other successes in Porsche Club of America races and we’ve crisscrossed the USA looking for competition and challenges. So, we’ve decided a good next race will be to do the California 8 Hour endurance race put on by the Pirelli World Challenge Series. The race is just 3 weeks from now so we have a lot of work to do to prepare. 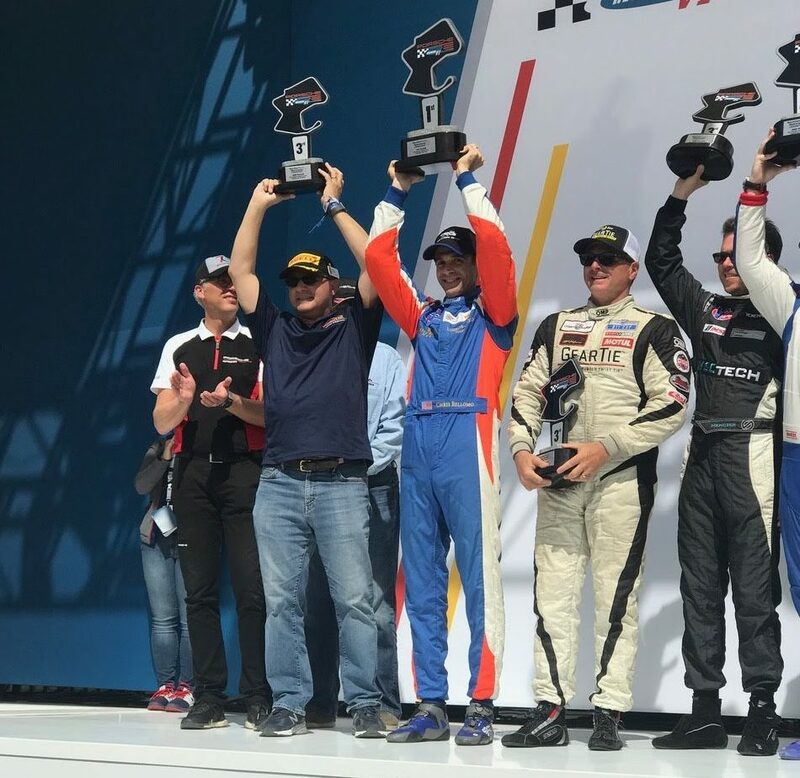 The race is staged at WeatherTech Raceway Laguna Seca so we are excited to try to add to the long list of TRG successes at Chris’s home track. The driver line up in the #67 Freem/TRG Porsche will be Chris, Tom Dyer, and Rober Orcutt. A race within the race for The Racers Group. The 8 Hour will be a real challenge of man and machine. After that we break out the 2019 calendar and start filling in the blank spaces. Next? “What another fantastic weekend for Chris. This is just a further culmination of the steep learning curve he has been on and he really nailed it this weekend. It was great having his family there, joining us for the weekend and having them watch their dad winning the race on Saturday!! Chris asked if we think he’s ready for the next step and we all agreed that he is and I’m so proud to see him jump in for the big 8 hour season finale with Pirelli World Challenge. He’s going to do great! Of course, a huge callout to our professional driver coach and my friend, Robert Orcutt. Robert drove for the team back in the early days with IMSA and we had a great run and have always liked working together. He is one of the most dedicated, astute and professional driver coaches we have ever worked with and takes huge pride in what he does. It’s been a great team effort for everybody and Robert really helped bring everything full-circle and we’re about to take the next step together. 2018 Porsche Rennsport Reunion VI Weekend in Review	Let’s Get Ready to Race! TRG Shifts into Laguna Seca for 2nd California 8 Hours!